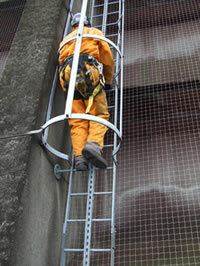 This tough bird netting seals off all structural openings and other possible roosting sites. Lightweight, pliable, UV stabilized bird netting won't deteriorate with age or lose strength when exposed to the elements. Standard mesh is 3/4". Structual mesh is 1/2". 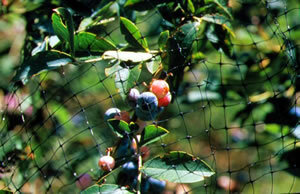 Prevent birds from roosting and nesting in undesirable areas or from eating fruit or crops with bird netting.
" 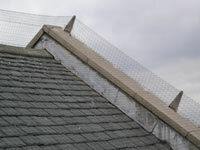 Bird Netting Solved My Pigeon Problem"
Based on information obtained from your site, I have solved my pigeon problem by covering the entire opening to my balcony with bird netting attached to a 2 by 2 frame. - Works on Other Animals: repels anything from birds to groundhog to deer.
" 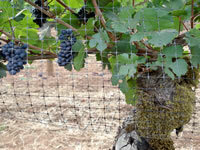 Bird Netting Stops Deer & Birds"
We currently use your bird netting to keep both Birds and Deer from eating our Roses.[...] This structure is enclosed with your bird netting on the top and sides, dimensions are roughly 15 feet wide, 70 feet long and reaches a height of about 15 feet in the center. If you want an action shot, it'll take a little while to coax a deer into view. Thanks for a great product!. We also are using one of the "Scarecrow's" to ward off deer from a flower allegedly not liked by deer. This is the first year we have had the opportunity to see its blooms. 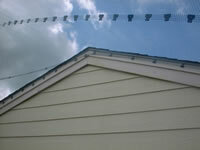 I put 2 pieces of Bird-X Bird Netting over my 50' X 20' popcorn garden to prevent bird damage. I also put up a fence to exclude groundhogs. The net extends over the top of the fence. I was surprised to see the groundhogs climb the metal fence to enter the garden, so I sewed the edges of the Bird-X to the top of the fence. The groundhog climbed the fence and the Bird-X to reach ears 6' off the ground! He could scrape the husk off the ears through the Bird-X, but no strand of the Bird-X failed, and the corn was undamaged! Next year, I may skip the fence and use bird netting to protect the garden. Oh, yes, it does also keep out the birds. - Decreases aesthetic and materials damage to propery. - Prevent Health Department citations and fines. 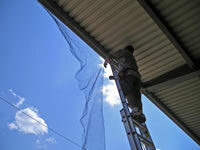 Standard Bird Netting is also available in a 200 ft Length and a 5000 ft Length.